This classic white cake comes out very moist with a delicate chewy texture that everyone will love. The buttercream is made with an Italian meringue which is the most stable type of meringue and is used to make frozen desserts and soufflés. This is a two layer cake. If you wish to have a three or four layer cake, make an additional cake layer. When choosing edible flowers make sure they are organic. You do not want edible flowers that have been sprayed with pesticides. Grease a 9 inch cake pan with removable bottom with one once of butter and cover bottom with parchment paper. Grease parchment paper and dust with 2 tablespoons of cake flour. 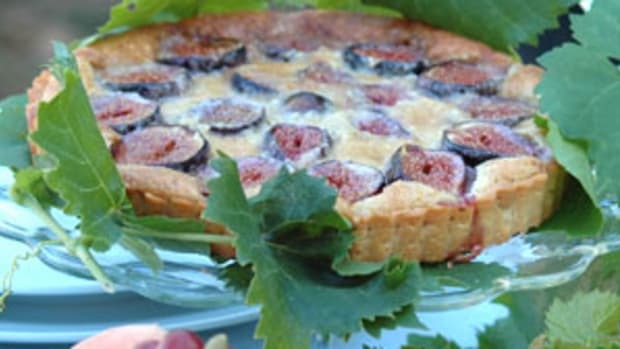 Mix wet ingredients: milk, egg whites and extracts in a medium bowl with a fork and set aside. In a bowl of a heavy duty electric mixer fitted with a paddle attachment, mix 1 cup of flour, sugar, baking powder and salt on slow speed. Add butter and continue to beat on slow speed until the mixture resembles moist crumbs. Do not over beat because mixture will then become too moist. Add 1/2 cup of milk mixture to the moist crumbs and beat at medium speed for 1 1/2 minutes (please follow time guidelines; otherwise if the batter gets overworked, it becomes rubbery). Add remaining 1/2 cup of milk mixture and beat 30 seconds longer. Stop mixer and scrape down sides of bowl. Return mixer to medium speed and beat an additional 20 seconds. Pour batter into prepared pan and level top with offset spatula. Bake for 20-25 minutes or until a tooth pick when inserted in the middle of the cake comes out clean. When cake is done baking, let cake rest in pan for about 3-4 minutes. In the meantime grease a cake rack. Invert cake onto greased cake rack, invert again and let cool completely about 1 1/2 hours. In a heavy duty mixer fitted with the paddle attachment beat butter until it is of spreading consistency, soft and smooth. Scrape butter onto a sheet of plastic wrap, and wrap and set aside until needed. Bring 3/4 cup sugar and 1/4 cup filtered water to a simmer in a heavy bottomed sauce pan and sugar has dissolved. Do not stir otherwise crystals will form in the mixture. 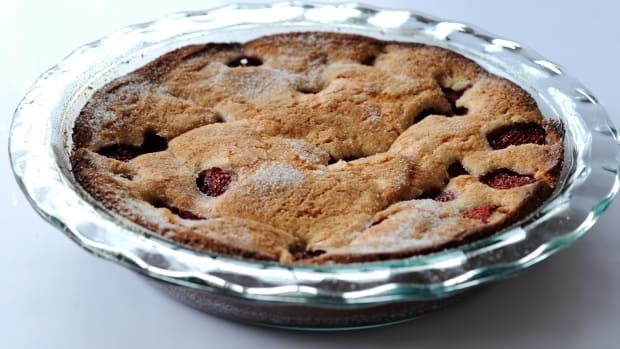 Once sugar has dissolved, brush down the sides of the pan with a pastry brush dipped in cold water and repeat as needed. 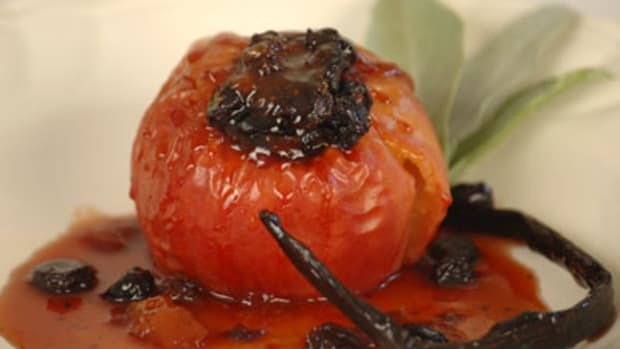 Increase heat and using a candy thermometer bring mixture to 248°- 250° - firm ball stage. It can take up to 30 minutes to reach this point. In the bowl of a heavy duty mixer, beat the egg whites until foamy and add the cream of tarter. Beat until soft peaks form. Slowly add the remaining 1/4 cup of sugar and beat until whites are glossy and firm. Slowly pour the sugar mixture in a steady stream into the meringue keeping the stream between the bowl and the whisk so the mixture is not splattered by the turning whisk. Whip until the mixture has cooled to room temperature. This could take about 15-20 minutes. You can tell it is cool by touching the bowl of the mixture (if you do not let the mixture cool, the butter will melt when added to the meringue and you don&apos;t want that). Mixture will look like marshmallow cream. Add softened butter 1 tablespoon at a time to cooled meringue. Keep mixing after the last tablespoon of butter has been added and buttercream is perfectly smooth. Add the rum or chosen liquor and vanilla and beat to blend. Use buttercream immediately or keep cool in the refrigerator until ready to use. Buttercream must be tightly covered and can be stored in the refrigerator for 2 or 3 days or in the freezer for one month. Make sure there are not any strong odors in your refrigerator as buttercream can easily pick up strong odors which will taint your flavor. To bring buttercream to room temperature when ready to use, beat in a heavy duty mixer with the paddle attachment to bring back its smoothness. If buttercream looks curdled do not worry. Keep beating as its smooth consistency will come back. Put the cake on a turntable or a cake plate set on a Lazy-Susan so you can rotate the cake as you cut it. Mark the middle of the cake @ 2-3 inch intervals around the cake with tooth picks. These tooth picks will be your cutting guide. Using a serrated knife, hold it against the cake and toothpicks and gently rotate the cake allowing the knife to create a guide around the cake which becomes your marker for where to cut. Insert the knife at your midway marker point you just created and cut the cake using a sawing motion while rotating the cake; this will create even layers. Place one cake layer cut side up on your cake plate. Dollop 1/3rd of the buttercream on top of the cake layer. Using an offset spatula, neatly spread and smooth buttercream across the top of the cake layer and down the sides (the sides do not need to be perfect as you will do this in the end, but do create a smooth even top layer). Place second layer of cake on top of first cake round covered in buttercream. Dollop remaining buttercream on top of cake and smooth over cake and sides with your offset spatula. This is where you can get creative making inspired patterns with your spatula. 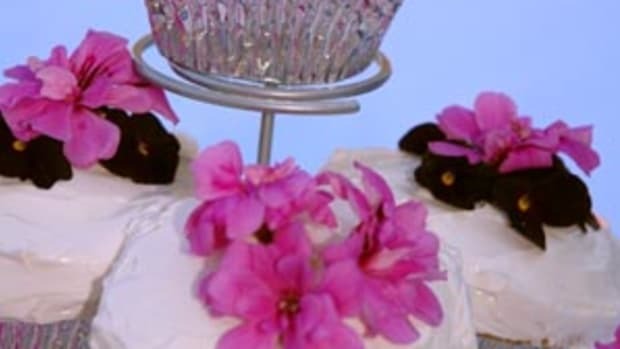 Once buttercream is smooth and you are happy with the texture, place edible geranium flowers (or other edible flowers of your choice) around the cake starting with the edge of the cake and working towards the center. Once the top of the cake is covered place loose petals around the base of the cake. Chef&apos;s note: use as many organic ingredients you can find for optimum flavor. 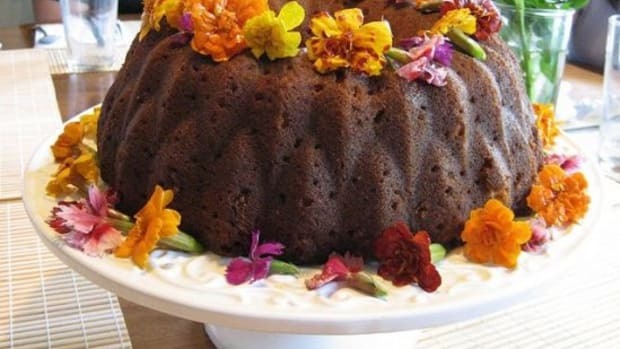 Carefully choose your edible flowers wisely! 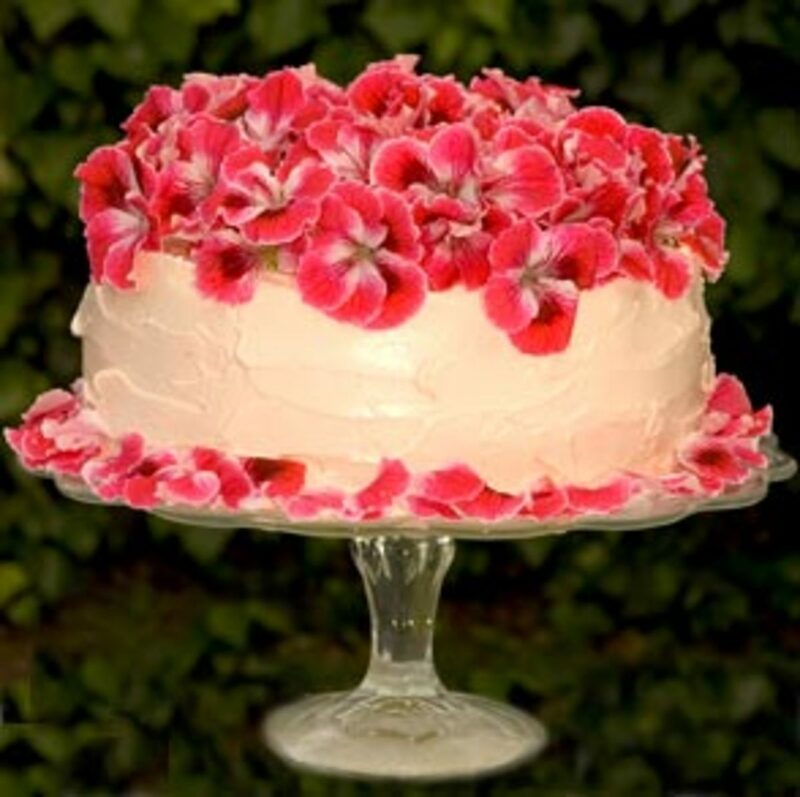 Martha Washington Geraniums used in this photo are not edible (our mistake!). But they make a beautiful cake.